Amazon is set to expand its social gaming division, hiring even more developers to work on its latest venture. With Sony announcing the sad demise of one of its most well-known studios, Studio Liverpool, this week it's nice to see some expansion in the games arena – even if it is for fair-weather social gaming. 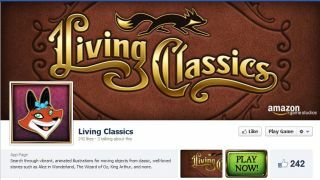 Amazon has already announced its first social game, Living Classics which is out now on Facebook, but its hiring of fresh blood shows that Amazon has bigger things in mind that just one game. The social-gaming sector is one that's in a state of flux. PopCap, owned by EA, is shedding 12 per cent of its employees in the US, while Zynga is losing executives in a bid to make more money and business analysts are calling for the company to look for a buyer. Amazon is expanding in this area, though, and is looking for employees in San Francisco – an interesting move as its headquarters are in Seattle, but an obvious one. The new job listings point to a mixture of social and casual gaming on the cards, so it seems Amazon will set its sights beyond Facebook, possibly into Google Play, the Apple App Store and its very own shop. We are expecting some more news on this in Amazon's tight-lipped announcement this September, where it is hopefully set to unveil the Kindle Fire 2. If you fancy working for Amazon Game Studios, then check out the company's dedicated jobs page. We've got a feeling Amazon is going to have to sift through a mountain of CVs.